In summer, dining al fresco is a delight for any meal. Consider hosting an outdoor tea party complete with scones, strawberry jam, and whipped or clotted cream. If tea is too tame, invite your friends for a competitive game of croquet, volleyball, or badminton on the lawn followed by a barbeque. Host a luau with an instructor to teach the hula. The possibilities for entertaining outside are limited only by your imagination. While the primary ingredients for a good party are fun, interesting guests, good food, and good drink, there are a few accessories to make the event more comfortable—and more festive. Add the following staples to your outdoor spaces this summer to help pull off a seamless party. Even at a stand-up cocktail party, guests appreciate having places to sit, as will your family on non-party days. To make outdoor living comfortable, outfit your garden with furniture for dining and lounging. Attractive, high-quality outdoor furniture also provides a smooth transition from the indoors to the outdoors and helps define the space as an extension of your home. In addition to chairs, consider furnishing an outdoor room with a love seat or two, end tables, and a coffee table to make a comfortable living room-type seating arrangement. Also, don’t overlook the possibility of an indoor-outdoor carpet designed to withstand all that weather can throw at it. A carpet visually defines the living space, contributing to the sense of a living room. Today, outdoor fabrics are almost indistinguishable from normal indoor upholstery material, and they come in a wide range of textures, patterns, and colours. In addition to being weatherproof, they are fade- and stain-resistant. You’ll find a wide selection of both premade cushions as well as yardage for custom-made furnishings. Extend the outdoor living season and provide a pleasant focal point outside with a fireplace or fire pit. You can install a wood-burning or gas-fired hearth, depending on your needs. Gas is less messy than the wood-burning alternatives, and it makes log storage and fire building a task of the past. You also eliminate the problem of wood smoke blowing in an unwanted direction. But with gas, you miss out on the pleasant crackle of a traditional fire as well as the special smell of burning wood. If you don’t have a built-in fire pit as part of your landscape and patio design, you can derive the same pleasure from the portable fire bowls available at most home supply stores. Bring on the s’mores! Whether it’s a simple hibachi, a kettle-style barbeque, or a high-end kitchen (complete with cook top, refrigerator, running water, warming drawers, and a dishwasher), cooking outdoors is a prime summer activity. If you’re looking for a quick fix, skip installing an outdoor kitchen and create work surfaces and buffet serving stations with inexpensive folding tables covered with pretty fabric. Vinyl-covered fabric that wipes clean is ideal for a work surface or table for children and is available at fabric stores in beautiful prints. good food, and good drink. Pizza lovers will thrill to an outdoor pizza oven. Host a pizza party where everyone tosses their own dough to flatten it out chooses from the custom toppings laid out buffet style and watches the creation cook in the blazing hot open oven. These ovens are not limited to baking pizza. Their cooking versatility ranges from baking bread to cooking meats, fish, vegetables, and even desserts. Outdoor lighting not only extends the usefulness of outdoor party spaces, it adds to the festive atmosphere. Consider stringing indoor-outdoor twinkle lights in your trees and shrubs, hanging an outdoor chandelier from an overhanging tree bough, or stringing Japanese lanterns between trees. For just a few dollars, you can add hugely to the festive feel of your garden. 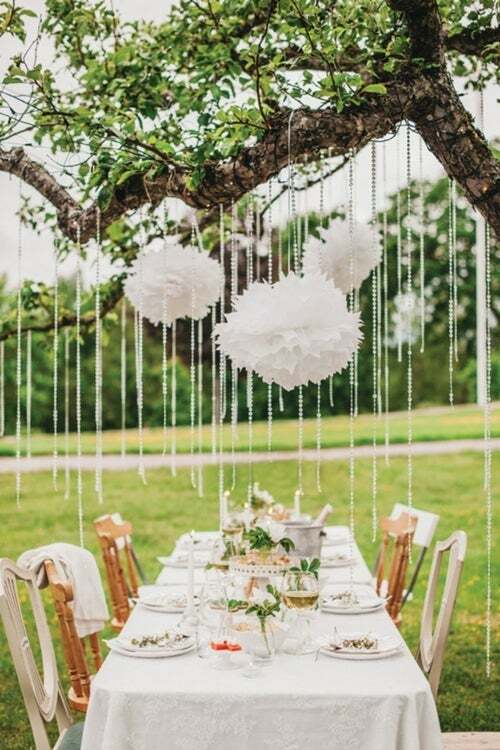 Whether your outdoor fete is elaborate or simple, casual or formal, themed or not, having friends and family over for a fun time in the garden is a wonderful way spend time this summer.